FLORENCE NIGHTINGALE AT EIGHTY-FIVE SAYS WAR HELPS TO MAKE MEN NOBLE. The Relief of the Light Brigade: The 11th Hussars reach the Russian guns. FLORENCE NIGHTINGALE, England’s “Grand Old Lady,” lives in an unpretentious house in a fashionable quarter of London. Her answer to my request for an interview with her in that house was written in her own hand, the writing showing few of the signs of the tremulousness of old age. Yet Florence Nightingale is eighty-five years old, and for nearly fifty years has not known what it is to be in good health. Sickness, however, has not destroyed her good nature. I found her lying on a sofa, comfortable with shawls and cushions. White hair, parted in the middle in the fashion of half a century ago, plus the lace cap of the elderly gentlewoman of England of to-day; feeble of voice, but eye still bright; manner still vigorous and face illumined with the light of interest in present-day affairs—such was the Queen of Mercy, the lady who nursed those who were shot from the saddles of the immortal “Six Hundred” who went into battle at Balaklava. 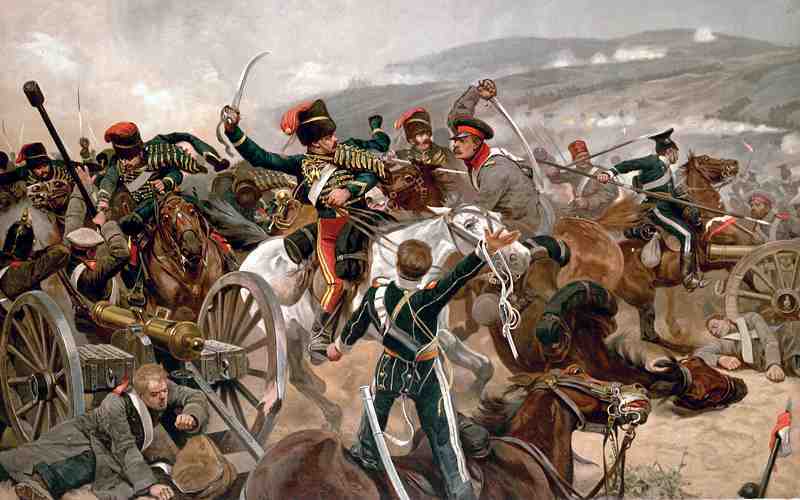 No recitation of “ The Charge of the Light Brigade” could be more thrilling than was the smile of the heroine of the Crimea, that afternoon, when I spoke of Balaklava. It seemed to bring back to her a keen recollection of the act that brought immortal glory to British arms. “Beggars in the streets of London were at that time leading the lives of princes.” she said. “compared to the life of our soldiers in the Crimea when I arrived on the scene with thirty-six nurses. “ And now, so long afterward. I am more than ever anxious to live. I have work still to be done. Yet I am far in the evening of life. How much greater, then, the desire to live on the part of soldiers in the morning of life! Yet war has its advantages. On the battlefields. as nowhere else. man practises the brotherhood of man. On the battle-field comrade gives even his life to comrade—in fetching his wounded fellow off the field. “Yes! I have found poetry in war— poetry in the behavior of men under their pains and in their sympathy for others who were in pain. About 670 soldiers began the cavalry charge, of which 40% were either killed (110) or wounded (160). Also, about 375 horses died. Survivors returned to their British lines within 20 minutes of the start of the combat. With 38 nurses, Florence Nightingale had set off from England only two days before, on 23 Oct 1854, and on 4 Nov arrived at the Scutari military hospital, outside Constantinople, Turkey. 2 Private James William Wightman, depicted in the foreground of the painting above was one of the survivors of the Charge of the Light Brigade. He was one of 36 taken prisoner. Wightman was repatriated under truce in Autumn 1855, and returned to England, where he died on 23 Feb 1907, at age 72. In 'Balaclava and the Russian Captivity' published in the magazine, Nineteenth Century (May 1892), he described his injuries: “A Cossack came at me and sent his lance into my right thigh. … My horse was shot dead, riddled with bullets. One bullet struck me on the forehead, another passed through the top of my shoulder; while struggling out from under my dead horse a Cossack standing over me stabbed me with his lance once in the neck near the jugular, again above the collarbone, several times in the back, and once under the short rib; and when, having regained my feet, I was trying to draw my sword, he sent his lance through the palm of my hand. I believe he would have succeeded in killing me, clumsy as he was, if I had not blinded him for the moment with a handful of sand. … We were soon conveyed in bullock-carts to a village a little distance in rear, where our wounds were attended to. I placed on the window-ledge the bullet which had been extracted from my knee. The Russian sentry took it and asked by signs if it had wounded me. I nodded, whereupon the Ruski spat upon it and threw it out of window, exclaiming, "Sukin sin! "—son of a female dog.” Wightman ends his article with reference to “our Annual Commemoration Banquet,” which is to where Nightingale would presumably have sent her message.